Join the discussion on our forums! 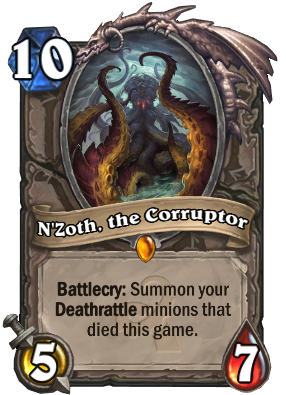 Come discuss N'Zoth the Corruptor over in our dedicated N'Zoth the Corruptor discussion topic. My boyfriend has a trading card based on him? Eagerly awaiting your Battle for Azeroth appearance! SIDE EFFECTS? NO. TRUST ME. Here from the WoW short Warbringers: Azshara. N'zoth is my fav Old God, and the trailer did him well. Hit my 2nd legend with N'zoth Control Warrior. Good times. It's rotating in April. That's almost 5 seasons to go. If you consider to play wild, then absolutely YES. He has an unique effect that will always be good if not excellent, as long as the card does not get nerfed. And if he does get nerfed, then congratulation, you got your dust back. Yes baby! Bring back those chests from Marin the Fox. My first gold crafted card for 3200 dust. I remember that back in 2015. Good times. Good decision. "Whispers of the Old Gods is the third Hearthstone card expansion. It was announced on March 11th, 2016 and will be released on April 26th, 2016." Okey. Yeah it was 2016. Time doesn't go by that fast i guess. I'm thinking of crafting and putting this card for my DK Hunter, since the hero power have the potential to generate lots of deathrattle beasts. And of course, the standard/auto -nclude Savannah HIghmanes, Kindly Grandmothers, Rat Packs and Infested Wolves are also there. It's the only deck i'm interested wherein I can put a N'zoth. So, is this card still worth crafting when it is about to rotate? And will be it decent/good on DK Hunter?